Valto provide UK based Microsoft Teams support. We offer Pay as you Go and Monthly support options to suit your budget. We provide bespoke Microsoft Teams Training for your organisation to help improve user satisfaction & adoption of the product. Microsoft Teams is a collaboration tool that brings Office365 together. 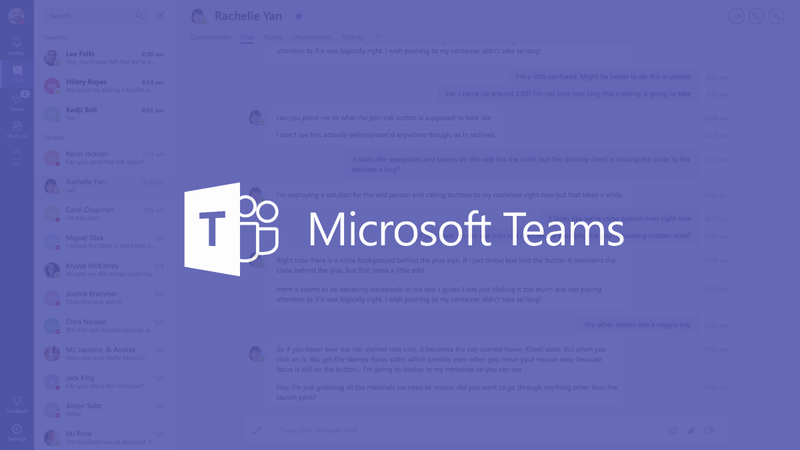 Microsoft Teams allows users to chat, share files, setup meetings and much more. Microsoft Teams is a very close competitor to Slack and is included with any license from Business Essentials to Enterprise E5, Microsoft also plans to bring a completely free version to the market place. Microsoft Teams is built on the same platform as the new Modern Sites. Valto has been building best practices and standards for our clients and offers a range of services for the product which can be found below. Find out how Valto can help you with Microsoft Teams Project. Call now on 03335 779 009. Microsoft Teams integrates heavily with SharePoint and the New Modern Sites. Decisions on how these should be built initially can affect the overall adoption and usage for the product. Too many teams may confuse and put off users of the platform while too little may not provide enough functionality for your organisation. There are a number of different ways to approach Teams whether it be dedicated Teams, Channels and integrations with the platform. Valto can help you make sense of Office365 and built a sustainable architecture recommending the best use of Teams, SharePoint Modern Sites and the other toolsets that can assist with your deployment. Teams is a fantastic product however the nature and ease of creating new teams and channels can lead to a governance nightmare. Valto specialise in building an easy to manage Office365 and Microsoft Teams platform that will grow and self-manage as much as possible including Site Deletion, Site Creation Approvals and integrations with 3rd Party systems such as CRMS & Financial systems). We’ve developed a number of best practices and software solutions that make management of the platform going forward. Get in touch with our specialists and we can help you build a Best Practice and Governance Documentation for Microsoft Teams and Modern SharePoint Sites. Bots that automatically send data from 3rd Party Systems to a relevant Team or Channel for example Sage sending a notification to a customer team channel when an invoice has been raised or there is an overdue payment. Automatically creating SharePoint & Microsoft Teams when new clients are created in a CRM system including ConnectWise, Dynamics and Salesforce. If you have any development requirements for Microsoft Teams get in touch and our specialists can help you enhance the functionality of the products even further. Are you looking to adopt the full suite of Office365 and Microsoft Teams? Looking to make a digital transformation and provide real organisational change to the culture and workforce. Valto have a unique tailored approach that ensures the adoption and organisational change required to fully embrace the Office365 Toolset. We have a step by step guided process for organisations to view, plan and adopt the Office365 tools including SharePoint, Microsoft Teams and other 365 products. Get in touch with one of our specialists to learn more about our process and discuss the next steps. We provide bespoke tailored training for your organisation on the best use of Microsoft we can work with your organisation to provide a tailored agenda and improve adoption and ROI for the toolset. Our experts can train at your location, remotely or at one of our offices. Valto’s fully qualified team of Microsoft professionals provide a Office365 & Microsoft Teams support service to organisations to help keep systems running properly and improve productivity. If you need assistance keep Office365 running correctly for your business, contact us today. A range of token based agreements to suit your organisations budget. Call on our Microsoft Teams to provide ongoing support and consultancy when you need it.